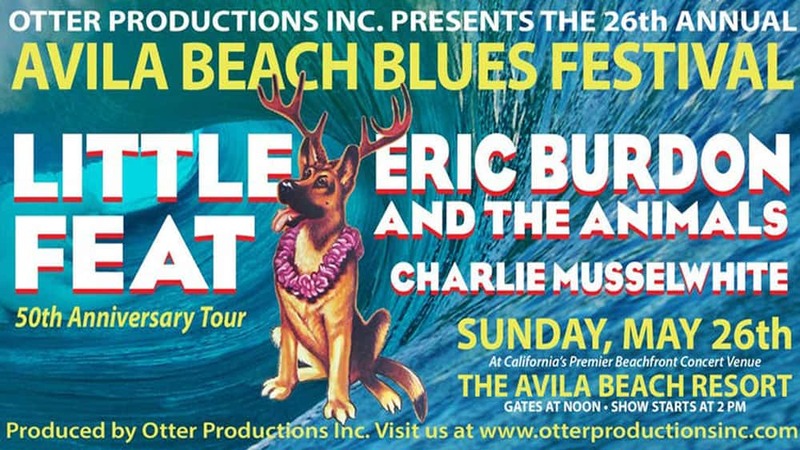 It’s time for The 26th Annual Avila Beach Blues Festival once again on Sunday, May 26th! This year continues the tradition of the biggest and longest running blues festival on the Central Coast, with top name entertainment against the backdrop of the Pacific Ocean. This is the party that kicks off the outdoor concert season! We are VERY EXCITED to be able to bring Little Feat (on their 50th Anniversary Tour) back to the beach, headlining the festival! Their last visit to the festival was in 1999. In the middle slot, debuting at the festival, will be Eric Burdon & the Animals, …and opening the show, a festival favorite, Charlie Musselwhite. Charlie’s last visit to the festival was in 1997.